After more than 24 hours of travelling, a missed flight, more than 6 hours of wait, we finally made our way to what feels like our new home away from home in sunny Los Angeles. It was worth the panic. And it feels so incredibly good you guys… So good. As soon as I sat my foot at the airport, a huge smile appeared on my face : it’s definitely my happy place. I can’t help it, I’m like a little kid back at it’s favorite candy store. The sun is shining bright all day, I’m back at the recording studio and well, I can’t believe that I’ve been wearing crop tops and skirts this whole day. It’s absolutely crazy to even think that it’s winter right now. I feel like I am completely cheating on the swiss weather! Here’s a little reminder of reality : bode freezing wind and wearing the biggest coat possible to deal with it. Luckily I got this huge white fluffy one from Gérard Darel, and it literally saved my life on our little Parisian trip a couple of days ago. To be totally honest with you guys, we spend quiet a lot of time in the States this year but being back in Europe for a while was so fulfilling : it felt so good to wander around through these beautiful streets, get inspired, do some exciting meetings and well enjoy days with friends and family whom we haven’t seen for a while. Our stay in Paris was an absolute blast. 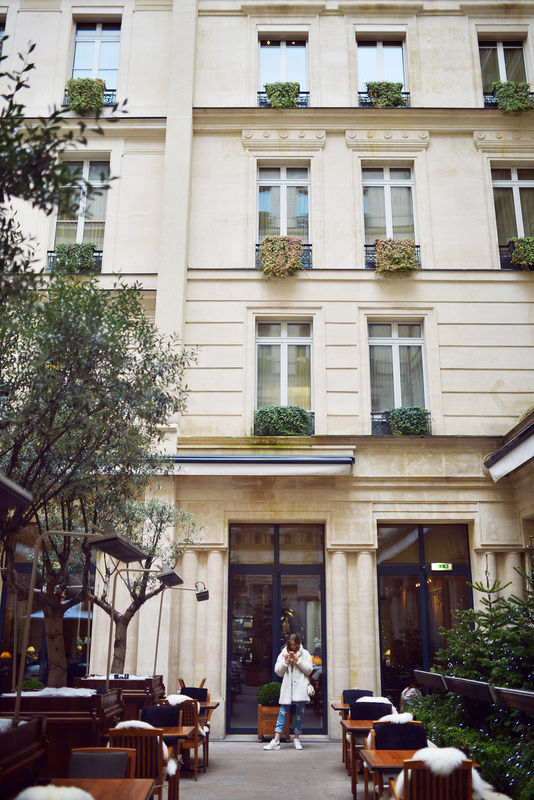 We enjoyed a couple of days at our favorite spot, the Park Hyatt Paris-Vendôme right in the heart of the city, got some Christmas presents for the family and of course did our last reunions before the end of the year. Although everybody was getting into deep holiday mode, we still managed to get some work flow going and well, 2015, as you might have understood, is announced to be pretty exciting… That’s all I can say. Thrilled to share with you this new look that I wore on one of those “I just wanna be comfy days” while in France. It’s all about the “barely no make-up” kind of face, messy long hair and a super, extra laid back outfit with these sick star print jeans from Stella McCartney. I have to say, I am quiet obsessed with them. Aren’t they the best? Lately, I don’t know yet if it’s because I got more lazy or busy, but I wanted to wear less make-up and underdress quiet a bit. Like they say, less is more, right? P.S Guys do you remember the beautiful, timeless, black Hugo Boss suit we shot in Los Angeles? Well don’t miss my feature in their eMAG which is out now, click here to see! It’s live!!! This look is so cool! Perfect combo! Love the coat and the sneakers! Adorable winter look. Love the cute jeans and coat! Cute as always. I'm in love with your sneakers !! You look stunning, love your coat ! Love the ring. I havent seen LV jewellery on anyone let lately I actually forgot they did jewellery. You look great as always! This coat looks so fluffy abd warm! Looove the jeans, so cool! this is super chic ! Fantastic coat and jeans, you look so stylish and so cute in this outfit! Such a cool and cozy look! Love it, especially the coat! You always look fantastic,with and without make up. I like this particular outfit a lot,mostly because of that huge cozy coat. It looks so warm and soft. This is for sure my kind of outfit, I'm going through the same, all I want to wear are these kind of outfits. The jeans are pure love and of course that coat is amazing! The outfit suits you!!! You created another awesome look! The bag is so gorgeous, as is the coat! OMG Kristina! You are never underdressed!! :D Love your shots, as always! Love this look! Very different from a lot of your previous outfits! It's nice to watch your style and tastes evolve! I don't usually comment, but sometimes I can't help myself! Oh I love this! It's always so nice to see you in relaxed and causal looks, you still manage to make them look so so glam! this makes me want to go back to paris so badly! 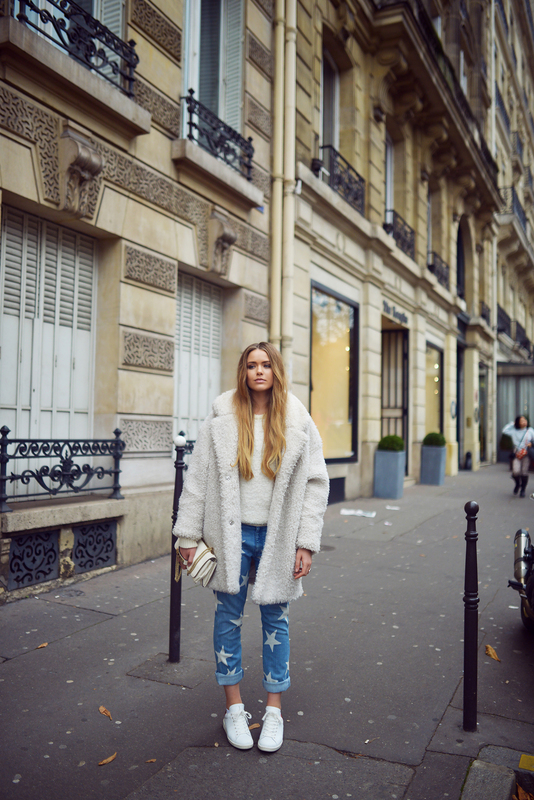 Love those stars jeans and the fluffy coat! So cool! amazing coat, i love your photos! you are the best! This is such a fun and cute outfit! Love the trainers and fluffy coat! honey, i think what you meant to write was ''quite'' since ''quiet'' means no noise, silence. love this look! I adore the simplicity! Amazing jacket! It look so warm and cozy but still super chic. love your jeans and accessorizes! Love the look, so causal yet not boring! Love this look! It reminds me of my day to day outfits I wear to school hahahah. Just looking for comfort and warmness in a big coat, loose jeans and sneakers! Very cute casual look, warm and cozy. Ce fluffy coat je l'adore! J'ai juste envie de m'emmitouffler dans un truc pareil cet hiver. Il fait tellement froid en ce moment à Genève. J'ai lu l'article ce matin, il n'y avait pas encore les liens vers les e shop, top de les avoir mis, merci! your outfit is stunning, i love it! i orderd some white sneakers at the zara- sale and can't wait to combine them, too! love that coat with this outfit! You look great with (or without) make-up! And this one is especially beautiful. Love it! you make those pants look so chic! I'm going to Paris in Feburary. Reading this blog post has got me so excited to go!! p.s adorefesting over those jeans! I was also in Paris two days ago...and I'm totally in love with this place! I have seen these coats everywhere recently, and I love them! I really like how you paired this outfit together. Cool outfit, your jeans are so fun. love all look but especially shoes ! J'aime Paris, c'est la plus belle vile du monde!!! J'aime ton blog, et me pense que toi te mérites le meilleur!!! Your coat is fantastic!! I absolutely love your Sneakers! And your handbag is lovely! I am SO in love with this look! I can't wait to buy those jeans. Wow! What a trip, hope you enjoyed your flight(s) and welcome back to LA! I love the outfit! 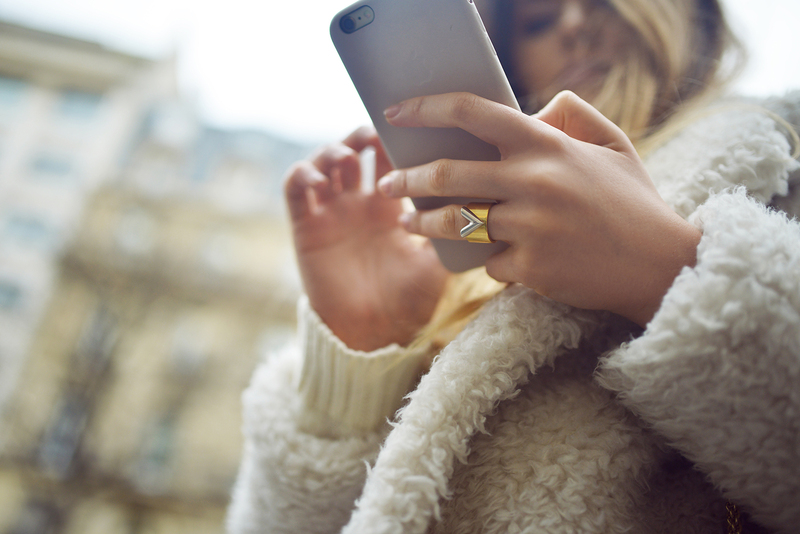 The cozy coat and the jeans are more than cool! Not my favourite look of you at all.. but I like the upper part of the outfit. The jeans are great, we love the whole look! Glad that you had a lovely holiday! Love this look! Especially those pants, which add such a fun edge! Great coat and I love your Valentino purse! Love that ''no make up'' look Kristina! It you have the time, could you do make up tutorials? I think that would be very interesting. I know you've done a few already and I love them! Happy 2015 by the way! All the best! amazing jeans, and love your coat!!! I love this coat! and this natural look suits you so well! Those pants are beyond cool! i love the star print! This outfit is so gorgeous! I love your coat! First of all, I love the outfit! You always pull off the most unexpected amazing things. I especially love the big furry jacket. It would be much needed where I live! I like how you kept the outfit casual. I wish you all the best in 2015! I cant wait to hear what you have been recording in the studios. Your voice is gorgeous, I bet they are amazing. Have the best new year, and I am always excited to see the new Kayture posts! Love the cool oversize style of the white fur coat and the star prints of the jeans are so chic! The jeans and the coat are to-die-for! Thank you so much for sharing everything, such an inspiration! home sweet home, welcome back to europe dear! You look so perfectly cozy! You look pretty with minimal makeup! OMG *_* that outfit is amazing! The combination looks so great. Love the bag and the trainers. It was very nice seeing you in Paris, your honesty and sweetness really underline your personality. See you soon again ! I love how this is a fun yet laid back and cool look, Kristina! I'd love to see more looks with sneakers, Converse and loafers for inspiration when you have time! Definitely need a fluffy coat, it's starting to get super cold here in Texas! Oh this coat looks simply so wonderfully fluffy, warm and cosy! Perfect winter piece! I would love to steal this outfit from you! Your whole closet actually... hihi! ;) You look lovely babe! Especially in those jeans, they're AH-some! You never fail to inspire us viewers Kristina!!!! These photos are so beautiful! Love this look! Those pants & fuzzy jacket are TOO awesome. I'm so glad you're happy with your move. I live in Mexico and it's so not winter right now, kind of cold but for people in Europe and north of the US this would be warm. I've never had to wear such a big coat because I've never experienced that cold of a weather. I wonder what it's like. This is a beautiful outfit and those are really great pictures. I love the stars on the jeans and how you dressed a casual outfit up with a fur coat. Great job. Gorgeous coat and love your handbag. I've been following you for over a year now, on Instagram and I have to say; I love your work ethic and style. My first time commenting, and I have a little girl crush on you haha and you have inspired me to start my own blog. Love the jeans and coat! You're amazing. I love your coat. I really like reading your posts but please, do be more careful about your writing. It doesn't send the right message when an article is littered with mistyped words ( quiet and quite for instance). Your make-up is very nice and well done. I really love this look, especially the sneakers! Dreamy! I just found my love for super fluffy coats and jackets. So I posted some fluffy outfits on my blog within the last weeks. I'm absolutely in love with that fluffy coat :) And Converse are my all-time-favourites. Great look! I can't believe you went to grammar school in Switzerland just like me and you came that far- living your dream every day. Thank you so much for sharing all of your mind-blowing experiences with your readers. It's obvious that each piece of writing and each picture are written and taken very carefully, with a lot of love for the details. Love the jeans and the relaxed way you wore it! Have a look at my first goal of 50 Goals in 500 Days Challenge achieved! You look amazing, as always and those jeans are adorable! I love how the print is big but it's not completely in your face. Such a lovely fluffy coat, I am in love!! I really like this look Kristina and the pants are really cute. The make up looks really natural and i think its perfect. Love the pant and the coat ! Love this look so much ! I have made a collection of you on popsico ,so much fun! Love you ! Oh, so perfect! LOVE IT!